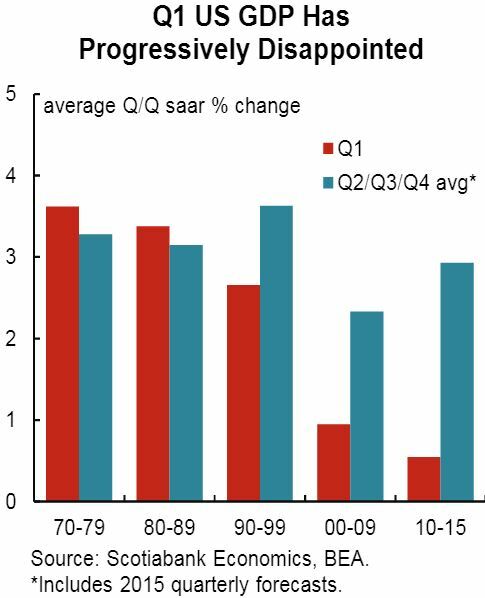 Economic data out of the United States remains lackluster. We now see more evidence that a strong dollar can be quite damaging to US growth, as manufacturing employment in the US unexpectedly shifts into contraction mode. 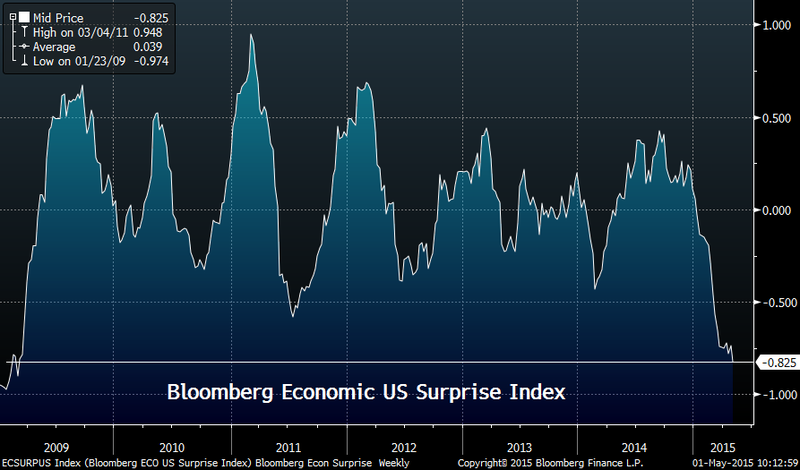 With this miss in the Friday's ISM PMI report (which was generally weaker than consensus), the Bloomberg Economic Surprise index hit the lowest level since early 2009. Some argue that this economic soft patch is driven mostly by seasonal effects, as Americans increasingly tend to "hibernate" over the winter. If so, will we see an improvement in Q2? There is quite a bit of debate around this topic, but so far a number of high-frequency indicators point to a softer than expected start to Q2. The ISM manufacturing report discussed above is one of them. 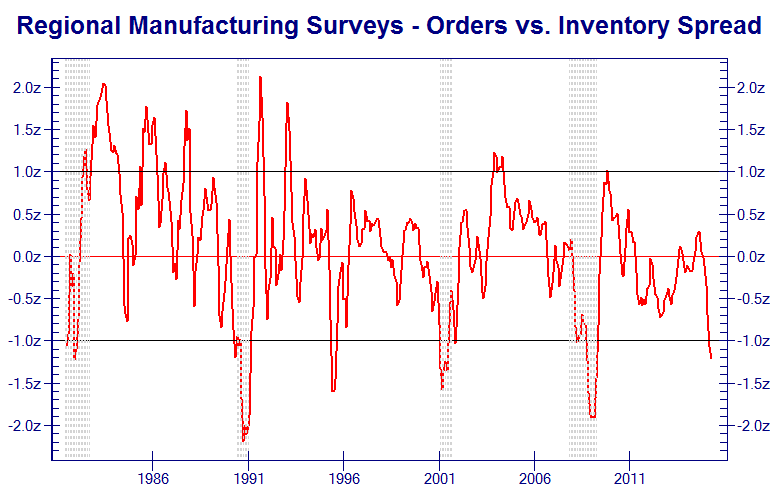 Moreover, regional manufacturing inventory levels seem to support that data. 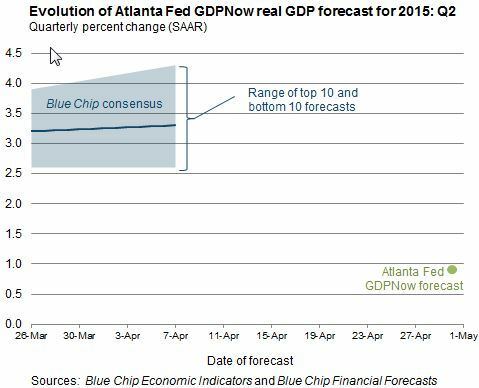 We also have the Atlanta Fed US GDP tracker - which correctly predicted poor GDP performance in Q1- pointing to growth that is substantially below the "blue chip" consensus. 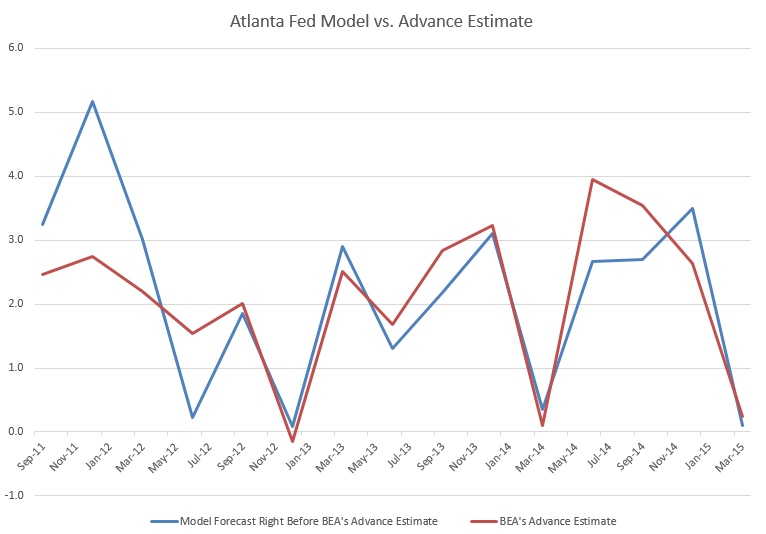 Note that this model has been shown to be quite reliable in predicting the initial GDP releases in recent quarters. The Fed officials seem to have gotten the message that it's not the slightly higher interest rates in and of themselves that would impede growth. While the US economy on its own can easily withstand higher short-term rates, it is the dollar's strength, driven by higher rate expectations, that could be damaging. 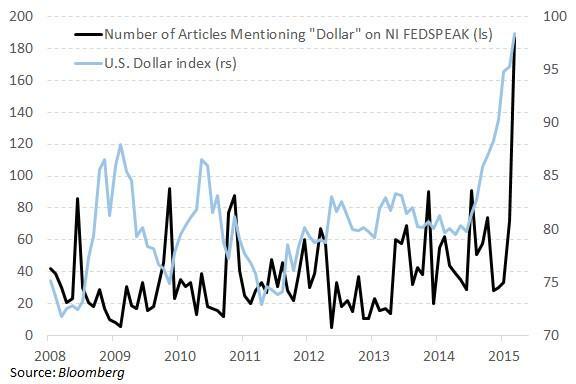 The chart below shows the increased focus on the dollar. While the rest of the world is easing policy, the US central bank can't begin tightening without negative consequences. And the global monetary policy is in a rapid easing mode. Except for Brazil, Ukraine, and a couple of other nations that have been desperately trying to defend their currencies, we've had over 30 individual rate cuts by central banks globally this year alone. There is another way to think about this effect. The chart below shows the global nominal GDP growth (measured in US dollars) - which is projected to decline in 2015 for the first time since 2009 (see write-up). By swimming against the world's monetary policy tide, the US risks "importing" some of that global slowdown. And that is indeed what the the Fed has done by telegraphing a hike this summer.